Value mostly leads growth over the sample period. However, value outperformance concentrates during the initial third of the sample period (collapse of, and initial recovery from, the 1990s technology bubble), and value appears to underperform growth during the balance of the sample period. For additional insight, we compare some performance statistics for the above ETFs. Value has higher average monthly return (barely) for only one of three size categories, but lower monthly return volatilities for all three. Value has higher CAGR than growth for only one of three size categories. Value has deeper MaxDDs than growth for all three size categories. 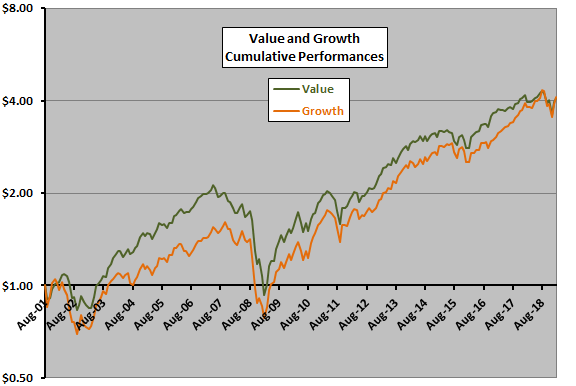 Since May 2007 (11.8 years), however, value has substantially lower CAGRs than growth for all three size categories. For (linear) trend analysis, we plot monthly value minus growth returns. 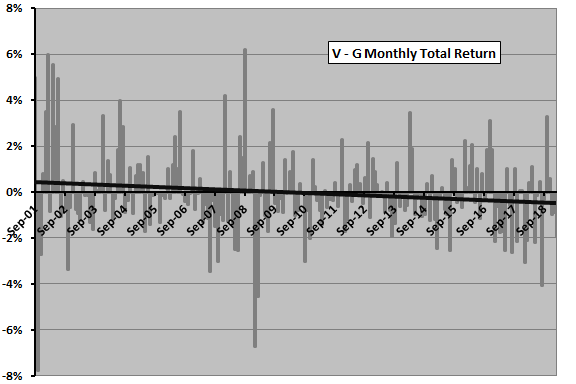 The next chart plots aggregated value minus growth (V – G) monthly total returns over the available sample period. Consistent with findings above, a best-fit trend line suggests that any early value premium disappears (and reverses) during the sample period. Volatilities of V – G returns appear to rise during U.S equity bear markets. However, the sample period is short in terms of any underlying economic/equity market cycles. 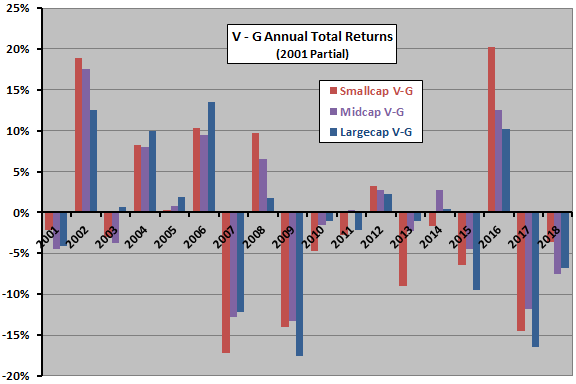 For another perspective, we zoom out to annual returns by value-growth pair. The value premium is erratic on an annual basis, making exploitation difficult. Average annual value premiums are -0.4%, -0.1% and -1.0% for the small, medium and large size categories, respectively. Are any calendar effects evident for the value premium? 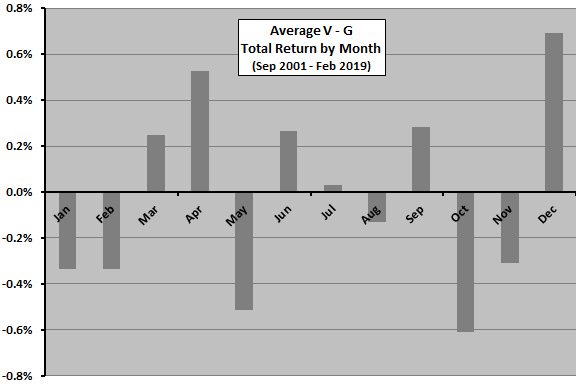 The final chart shows average V – G monthly total returns by calendar month over the available sample period. Results suggest that investors tend to dump value in favor of growth during October and return to value in December. However, with only 17-18 observations per calendar month, the sample is very short for this kind of analysis. In summary, evidence from simple tests with 17.5 years of available data does not support a belief that investors can reliably capture a value premium via popular value-growth ETFs. The criteria for constructing/rebalancing the ETFs may not be suited to exploit the value premium efficiently. For example, it may be that capturing the value premium depends on excluding financial stocks as done in many academic studies but not done in forming these ETFs (financial stocks tend to concentrate in value ETFs). As noted, the sample period is short for reliable measurement of a value premium that varies with some long economic/equity market cycle, and for assessment of calendar month effects.